Born on March 11, 1976 in Almaty. In 1998 he graduated from the Faculty of International Relations at the Kazakh State National University named after Al-Farabi. In 2016 President of the Republic of Kazakhstan Nursultan Nazarbayev appointed M.Nurtleuov as the Ambassador Extraordinary and Plenipotentiary of the Republic of Kazakhstan to the Republic of Finland. Since 2017 assumed duties as the Ambassador of Kazakhstan to the Republic of Estonia with residence in Helsinki. Diplomatic rank - Envoy Extraordinary and Plenipotentiary. 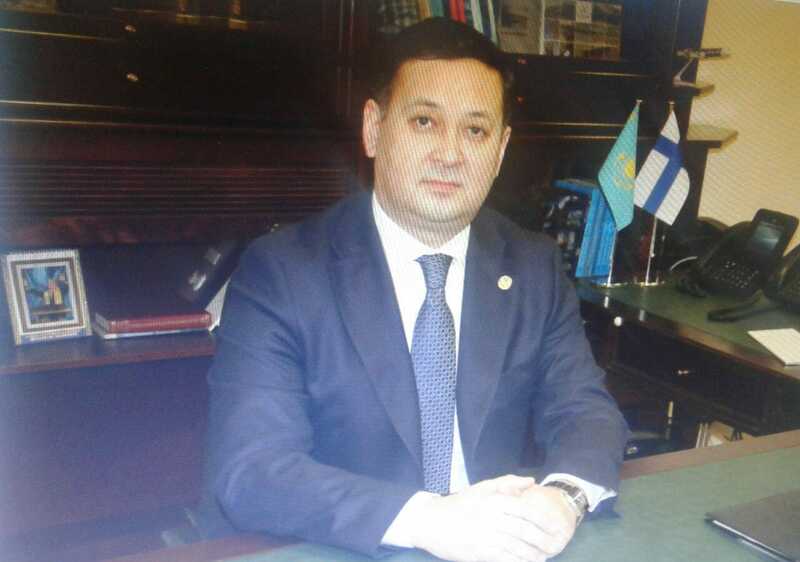 Diplomatic carrier of M.Nurtleuov began in 1998 when he joined the Ministry of Foreign Affairs of the Republic of Kazakhstan as Referent and then as Attaché of the State Protocol Services. of Foreign Affairs. Three years later, he was appointed as the Chief de Cabinet of the Minister. The same year, he joins Apparatus of the Senate of the Parliament as the Deputy Head then served as the Head of the Apparatus. During this term he also was actively involved in Senate’s international activities and made contribution to the implementation of a number of key initiatives put forward by Kazakhstan and it’s leader. In particular, in 2008 he chaired the Inter-ministerial Working Group in charge for the 17th session of the OSCE Parliamentary Assembly in Astana. This forum has become the first ever event of the OSCE parliamentarians held in the CIS region. At the same time, it has been an important threshoulder in the eve of Kazakhstan’s chairmanship at the OSCE in 2010. Being fully committed to Kazakhstan’s foreign policy priority on promoting dialogue among civilizations and religions, M.Nurtleuov was appointed by President Nazarbayev as the Secretary to State Commission responsible for organization of the III Congress of Leaders of World and Traditional Religions in Astana in 2009. After his return to foreign office in 2011 in a capacity of Ambassador-at-Large of the Ministry, Nurtleuov covered a number of issues on Kazakhstan’s inter-parliamentary track and bilateral cooperation with Asia. Later, he heads the respective division at the Ministry - Department of Asia and Africa. In December 2011, he was honored to join a team of Kazakhstan’s Permanent Mission to the United Nations Office and other International Organizations in Geneva as the Minister Counselor. He coordinated activities of Kazakh delegation at a single multilateral disarmament negotiations mechanism - Conference on Disarmament. In a teamwork with other Kazakh officials he actively participated in talks within the framework of the First Committee of the UN General Assembly in New York and the NPT Review Conferences in Vienna. He was member of the Geneva Center for Security Policy (GCSP). During 2014-2016 he served as the Deputy Head of Foreign Policy and Analysis Center at the Administration of the President of the Republic of Kazakhstan. This extremely interesting and highly responsible period of carrier allowed him to accumulate a new experience and skills for his further development as diplomat. the most significant occasions – a working visit by the President of Finland Sauli Niinistö to Kazakhstan within the margins of “EXPO-Astana-2017” International Specialized Exhibition, official visit by the President of the Republic of Kazakhstan Nursultan Nazarbayev to Finland in October 2018, as well as an official visit by Estonian Prime Minister Jüri Ratas to Astana in November 2018. He was awarded by the Order of “Kurmet" (2010), Letter of Appreciation from the President of the Republic of Kazakhstan (2018), numerous medals and Honorary Diploma of the CIS Inter-parliamentary Assembly (2011). Murat Nurtleuov speaks English and German. Married and has four sons.